Spicy hot...... but wonderful. Habañeros, mango and honey just go together on chicken. You can present these anyway you would like, but the photo shows a very tempting presentation if you need some ideas. 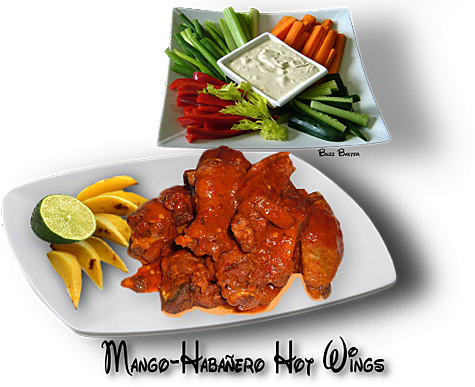 Crudites with a ranch dressing and fire roasted mango slices with a squeeze of lime go very well with the wings. marinate for 4- 6 hours in the refrigerator. be done  on a sheet pan in a 350°F oven for 25-30 minutes or deep fried if you so desire. **SEE COOK'S NOTES**. Serves 4 - 6 depending  on who's eating them. In our house,  probably 2.
vinegar until desired thickness attained. compatible with the rest of the recipe.